CURRENT VERSION: 1.0.7 FULLY COMPATIBLE WITH 1.9.3.1 Security Patch. Looking for a hip-hop or street style fashion store? Siotis is here to answer your call. 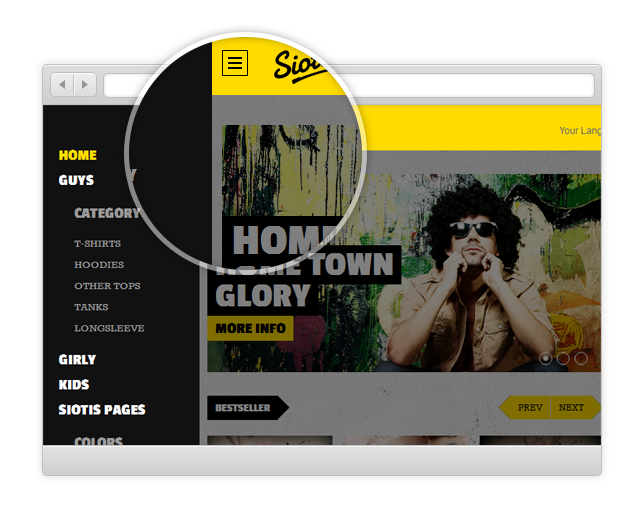 Siotis now comes with 6 exciting extensions including: Mega Menu, Slideshow2, Products slider, Product, Quick Buy and the awesome Basetheme. 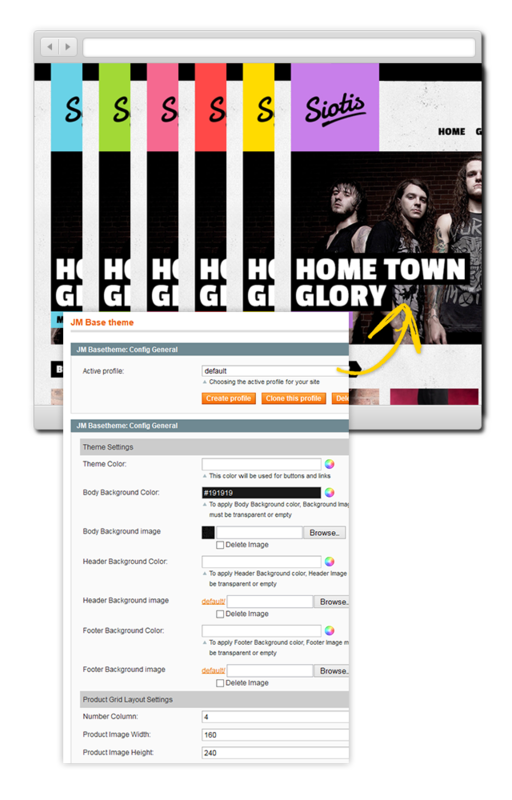 This means you now have unlimited color choices for your site with much less effort spent on customization. 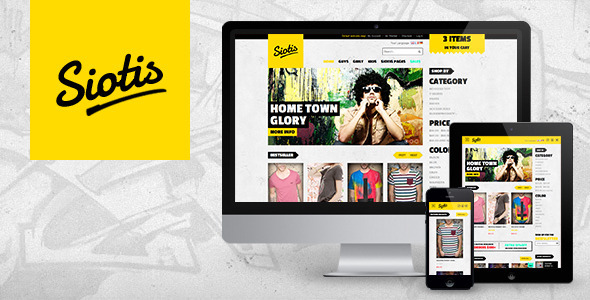 Siotis is a responsive template with the extra bonus of an Off-Canvas menu for mobile. All these amazing features are blended together in Siotis – your powerful, stylish and attractive Responsive Magento Fashion Theme. 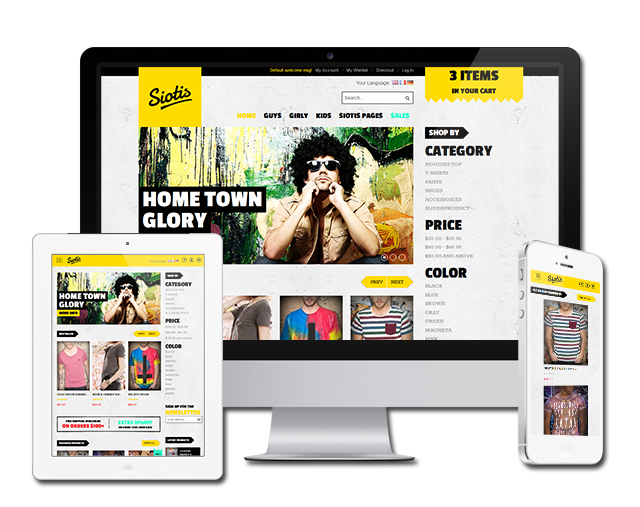 Developed by us, UberTheme.com, Siotis is the first Responsive Magento theme which supports off-canvas navigation used in mobile and tablet devices. The theme also comes with the latest QuickBuy module, which supports transitions and effects developed specially for this theme only. Not to mention the Mega menu with featured products, Basetheme for easy customization and an auto-updated shopping cart feature this theme is loaded with. Just a glance at Siotis and you will be drawn to it by its bold big typography and contrasting color blocked graphics. 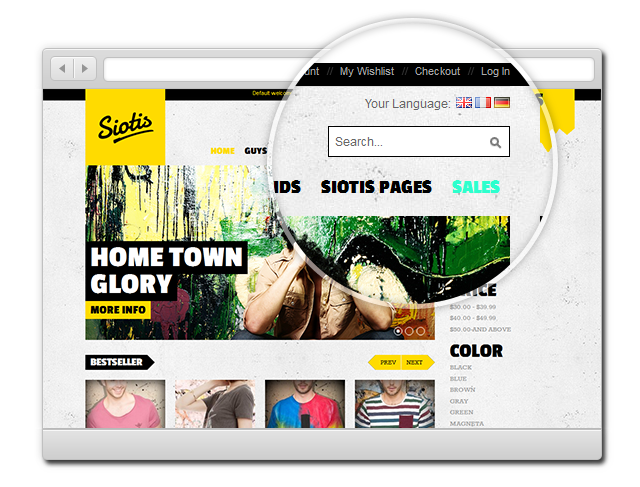 Sitois Magento theme has itself a very strong urban style in every corner but still keeps down to minimal design. If you ever surf Facebook on mobile or tablet, you must be familiar with the idea of Off-canvas menu on Facebook mobile already. Technically off-canvas is a design pattern which has up to 2 or 3 panels, displayed differently depending on device’s width. Taking advantage of off-the-screen space, off-canvas navigation keeps the content ready and be visible when users take action to expose it or when on a larger screen mode. 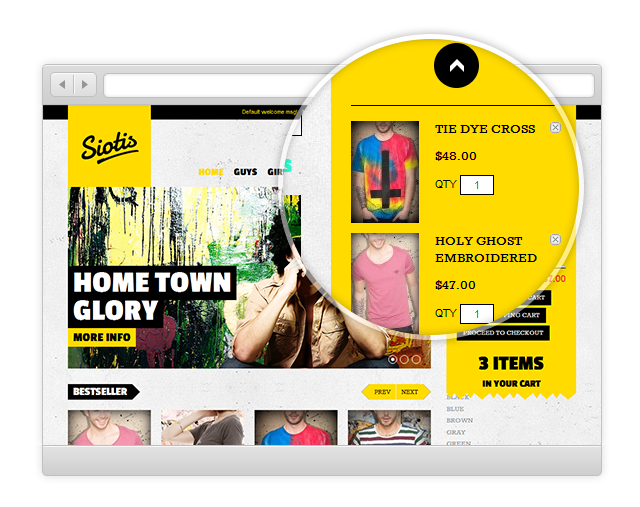 Siotis is the first Magento theme that supports Off-canvas navigation, applied for the main menu and shopping cart. 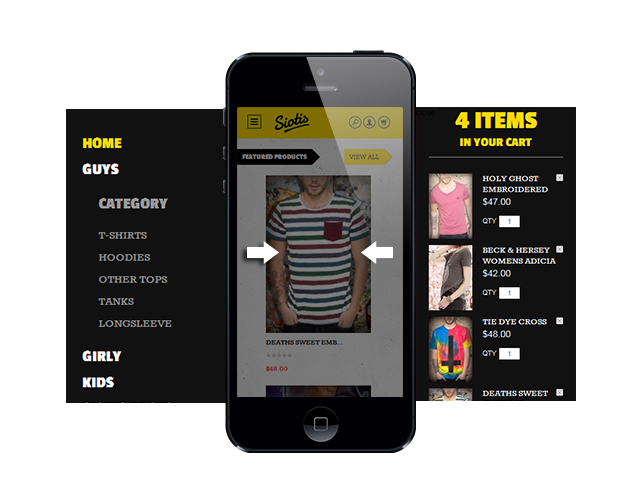 Imagine how convenient for your online shoppers to views all your products on mobile without losing track where they are. Want to have your own color of choice rather than our 6 color schemes? 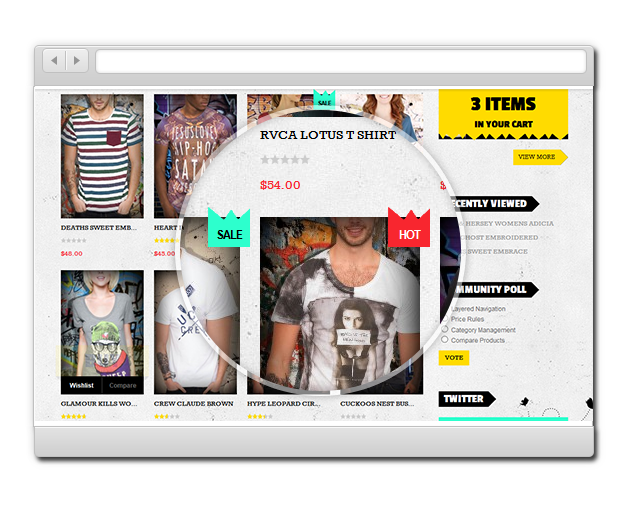 Basetheme gives you the full control in customizing Magento theme color schemes. A quick setting in back-end and you can set the color you want from header to footer, you can even personalize the product details page and product display layout. 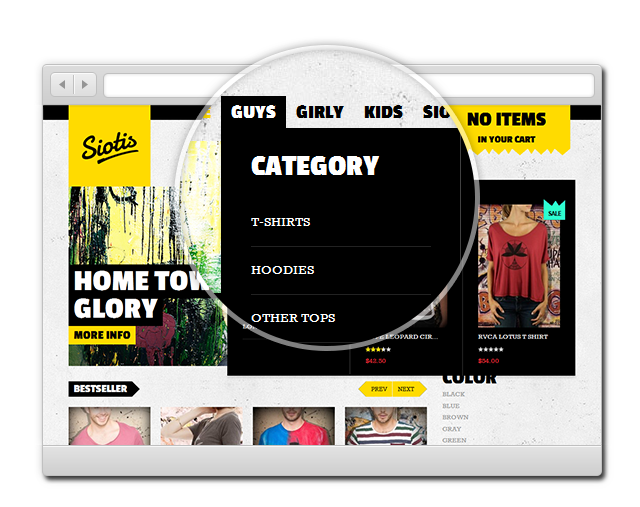 As a compulsory part of our Magento themes, Siotis supports a slick Mega Menu with custom blocks to display featured products and even embed videos. 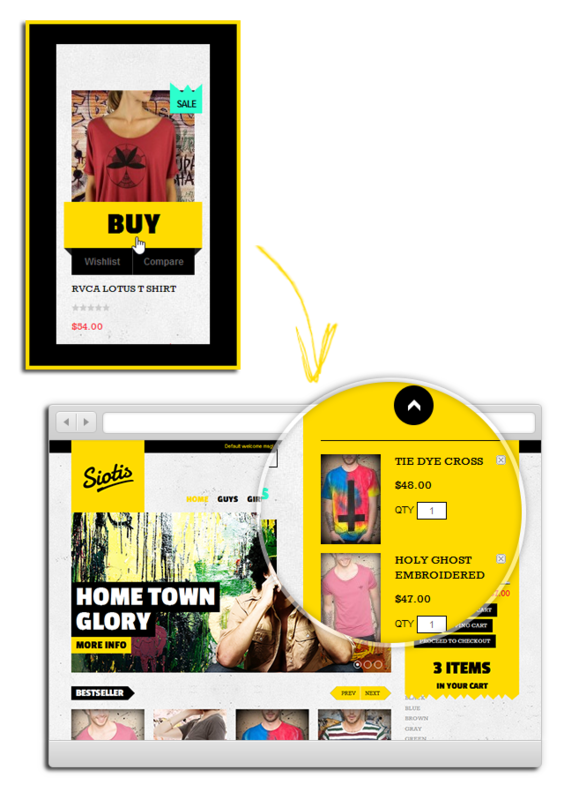 An auto-update shopping cart without reloading the page is the main advantage that your store would have with QuickBuy Besides, Siotis also support various effects and give an interesting online shopping experience. In this theme Siotis, we support the menu style for multi-language: English, French and German..etc.. The extra HOT and SALE badge on any product.